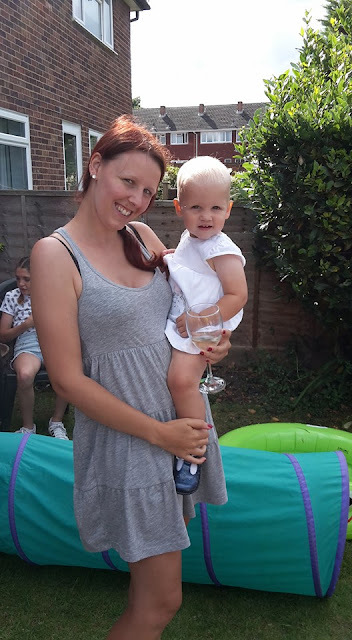 I was recently tagged by blogger Mum Aime to write about the 10 things that I have learnt since becoming a mother. So here they are. Anything.. absolutely anything. These are all things you would never do for a lot of other people but because they are your child you automatically just do it. You sacrifice sleep, hurt yourself so they don't get hurt, give up your last biscuit, let them be sick all over you, act stupid in public to make them laugh, wipe there snot (even with your hand because you don't have a tissue) and you just live each day to do anything to make sure your child is taken care of. I have never been a morning person and always loved my sleep and the thought of getting up before 9am, sometimes even 10am was always early to me. Now if I get to sleep until 9-10am I jump up celebrating because that's now classed as a lay in. 8am is no longer early to me but a normal time to get up and I am definitely still tired at 7am but I can cope with it a lot better than I used to be able to. But there was times where I literally was getting woken up each hour and I still managed to get on with the day and cope with that. I guess you don't really have much choice and that helps teach you that you can cope with no sleep. I've always appreciated what my parents do for me and how much of a great childhood they gave me. But ever since I've had Lily, you realise so much more what they did for you. You also understand a lot more about the love they have for you, because now you feel that love for your child and then just know how precious you are to them. I also appreciate the help they give me now. Although my family is far away from me, I can always call them up and talk to them when motherhood gets a little too much. I think we all go through a time when you feel like you don't need your parents as much. You have gained independence and you definitely don't feel like they are your best friends though the teenage years but when you have a child you need them more than ever. I remember the day after I had Lily and was in the hospital and my mum came in the room and I just burst into tears and needed a big hug. You really don't know that feeling of love until you feel it for your own child. Its instant, its forever and it takes no effort. 5. How much more you will worry, but then other things are not worth worrying over. The worries you have over your child are sometimes so ridiculous. I always worry about silly things like "What if the house catches fire?, What if the car crashes?" Before Lily these would have never been things I would worry over. But on the other hand there was so much I would worry over that just aren't worth the worry now. For example If Lily accidentally breaks something like the expensive candle she broke the other day, I don't care about the candle and more that Lily was okay. Possessions are just not important when you have the most important possession of all. Then for me days out with Lily is so much more important than having a spotless house. In my opinion the dishes can wait until later and I would much rather spend some quality time with Lily. I think there was a time in my life where a lot of it was all about me me me. But now everything for me is all about Lily. I never get to watch my own programmes on Tv in the day, but I feel very happy to let Lily get her choice of Tv. Then I rarely spend money on myself, I would much prefer to spend my money on Lily. Then days out, I rarely go places that I would love to go. I always think of where Lily would like to go. It is definitely important for me to be happy but the way I see it, If Lily is happy then so am I. When you are a mum you definitely don't get it often. In the day I don't even get to go to the toilet alone. So when I do get it then I really appreciate it. I remember a few weeks ago my partner looked after Lily for the day and I took a walk to the shop to buy household essentials and I just took a nice deep relaxing breath knowing I was having a relaxing walk on my own to the shops. I sometimes appreciate my me time so much that in the evening I end up staying up to late because I know that I won't be getting much of it for another 24 hours. It does get quite disappointing that suddenly you have a baby and then some friends you just suddenly don't see very often anymore or sometimes at all. But its the friends that do come to visit and do come on a night out with you and call to ask how you are doing who you find are the real friends. Its also really hard to make friends. Its almost reminds me of dating, you really want to meet someone who will become a really good friend. Then your at the park and you do meet someone and you would love to meet them again but then you have to ask for there number. Then when you get it you need to be not to forward and not text straight away or to much. I have definetly made some new friends but its very hard to see them all the time with children and it ends up being not very often. Having a child definetly means that you have to have patience. As they grow they definetly test your patience. Firstly by not always doing as you say and you have to ask 5 million times, sometimes it may be that they walk so slowly when your in a rush. But being a parent really teaches you to take a deep breath and just relax because they are only little and it is us that need to set a example and help them learn. Ever since Lily was born life means so much more to me now. Lily is growing so fast and I try to spend as much time with her as possible doing as much with her as I can. My Life has gotten so much better now that I have Lily in it and now have my family. I would now like to tag my friend Rebecca Phillips from Mum of a Premature Baby to tell us all about what she has learnt since becoming a mum. Would also love to know one thing that all my mummy readers learnt from motherhood so please do comment below. Wait, you get to sleep in until 8? I'm lucky if mine stays asleep until 6:30 on a weekend.